Intro: This tour is the second of a three-part programme designed to permit a detailed examination of the tram systems in Spain. The first tour, in 2018, visited the cities with trams in the Levant (the east of the country). Along the way, surviving narrow gauge railway networks were sampled, and transport museums visited, too. Many of these systems have been implanted only recently in some of Spain’s most historic and famous cities—for example, Granada and Sevilla—and this will permit a series of interesting parallel visits to be offered to those of a more cultural persuasion. The tour has been designed, and will be led, by John Bennett, one of the News Editors of the prestigious railfan magazine ‘Locomotives International’. John lives in Spain and speaks Spanish, and is responsible for compiling all the Notes & News about Iberia (Spain & Portugal) which appear in the LI magazine. 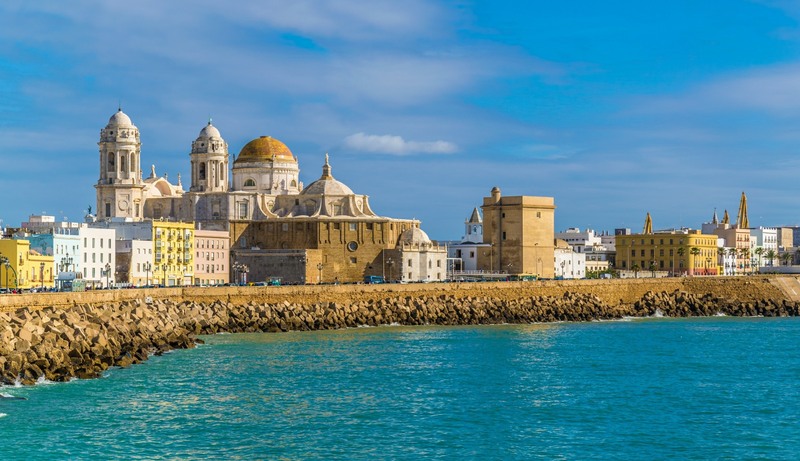 Day 1 Monday 28 October (D) Flights from most UK airports direct to Alicante. Our bus will meet us at the Airport and transfer us to our hotel. 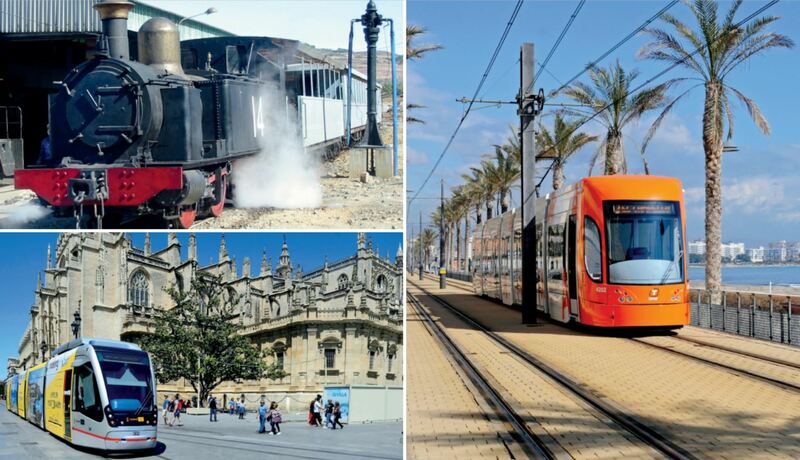 There will be an Option to spend the rest of the day riding Alicante’s trams. The system consists of three Lines totalling 47.4 route-kilometres and is worked by 23 Bombardier trams, and nine Vossloh Tram-trains built (or to be built) in the Stadler factory in Valencia. Overnight in Alicante. Welcome dinner. Day 2 Tuesday 29 October (B) Today we will go by train to Murcia and then spend the rest of the day riding Murcia’s trams. The system consists of two over-lapping Lines totalling 18 route kilometres of track, worked by 11 Alsthom Citadis-302 model trams acquired second-hand from Madrid. Overnight in Murcia. Day 3 Wed 30 October (B) Today we drive to Granada and then spend the rest of the day riding Granada’s new tram line, 15.5 kilometres long and including an underground section in the city centre. It is worked by 13 five-section Urbos-3 articulated trams from CAF. We hope to have time to hunt down the surviving cars of the erstwhile Tranvia Sierra Nevada which closed down in 1974, and there will be an option to visit the Alhambra – these visits have to be reserved in advance and anyone interested should notify PTG at the time of booking. Granada was the last city in Spain to be recaptured from the Moors (only in 1492), and the Alhambra palace and its gardens are recognised internationally as fine examples of Arabic culture. Overnight in Granada. (2) The Metro Sevilla system is mostly underground (and complete with platform doors) but is operated by 17 of CAF’s articulated trams. Four Lines are planned and a total of 18 kms were thought to be open when this was written. Day 6 Saturday 2 November (B) Today there is an option to stay in Seville, sightseeing (lots to see! ); but otherwise, come for a rail trip to Cádiz (1hr 40min) where they are building a 24 kilometre one Line (but two sections) tramway due to open by May 2019. It will be operated by seven of CAF’s “Tren-Tram” vehicles which were on trials when this was written. When we have discovered exactly what is going on, and hopefully had a ride and secured some photos, we will return to our hotel in Seville. Day 7 Sunday 3rd November (B) Today there is an option to stay in Seville, riding trams or sightseeing; but otherwise come with us to visit the remains of the Rio Tinto mining operation and its associated British-equipped railway built to take the ore down to the coast. We will have a ride on the steam-hauled tourist train and visit the mpd (more locomotives awaiting repair). Then we will have Lunch before visiting the Mining Museum (more locos, cosmetically restored). At the end of the day, we will return to our hotel in Seville. Day 8 Monday 4 November (B) Road transfer to Seville Airport for return flights. The coach will also transfer to Malaga airport for a wider range of flight destinations. Direct flights from most UK airports including Bristol, Bournemouth, Heathrow, Gatwick, Luton, Birmingham, Liverpool, Manchester, Newcastle, Edinburgh and Aberdeen.